Progressive web apps are a hybrid of a website and an app that you might use on a tablet or mobile. Making one has a lot in common with creating a website, but with a few key extra files and concepts involved. Responsive — Fits any form factor: desktop, mobile, tablet, or whatever is next. Connectivity independent — Enhanced with service workers to work offline or on low-quality networks. Installable — Allows users to add apps they find most useful to their home screen without the hassle of an app store. Linkable — Easily share the application via URL, does not require complex installation. This post will show you how to make one in an hour that you can then host, use online as a website, and use offline and as a mobile app. To give an example of what you could create, here is an example of one I made earlier based on Google’s codelab on web apps. It generates a QR code from the text you enter. To get started, clone this template repo (or just copy the bits you need). This includes the website project structure with everything you need to make an app. 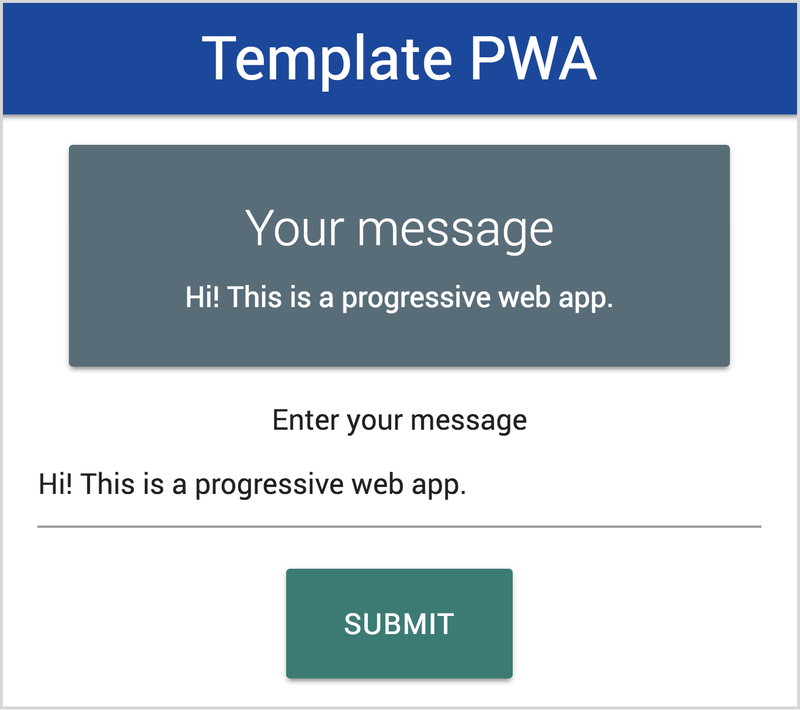 These are the files included in the template project, which you can then add to in order to make your own progressive web app. For styling and a range of quick to use components and effects, this has materialize.js and CSS from materializecss.com. Remove or replace it if you prefer something different. public/service-worker.js: Service Workers allow you to run your app offline, as well as other innovative things. Currently, this will cache the app’s files for quick local access. Read more about this in Google primers: service-workers. public/manifest.json: A JSON file specifies how your app appears to the user in the areas where they would expect to see apps (for example, the mobile home screen). It also directs what the user can launch, and more importantly, how they can launch it. Read more about this here. public/index.html: The main HTML page for your app. Currently it has title nav bar, a card, an input field for a message, and a button to display this on the card. public/style/style.css: Add your own styling to this file. images/icons: Create square icons of the number of pixels for each size and save them here. These will be used by browsers and operating systems. The Console tab will show you the logs from the app. On the Application tab,you can see the data stored locally. Storage → Local Storage shows you the message stored by the app. If you encounter problems, it’s often worth switching the service worker off and on again, then clearing the cache and reloading the app. You should be able to visit the hosted app in your browser, and add it to your home screen on your mobile! The more you learn about progressive web apps, the more you can create great user experiences across platforms and browsers for a wide variety of applications. The Google developer’s resource on progressive web apps has a wealth of information about this popular web technology. This tutorial will cover how to create a web extension that works across multiple browsers.